China's Yutu Lunar Rover landed on the moon just over a month ago, and promptly started sending back photos. Unfortunately, it looks like China's triumph could be short-lived; the Xinhua news agency reported that the rover stalled in its tracks while shutting down for the evening. Space is hard! The WSJ reports that the announcement of Yutu's mechanical problems came exactly 10 years after NASA successfully landed the still operational Opportunity rover on Mars. 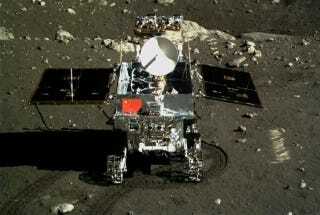 Yutu's difficulties underscore how hard it is to land a complex piece of machinery on an astral body from hundreds of thousands of miles away. Sure, Yutu was only supposed to run for three months in the first place, but even that short period proved a challenge.